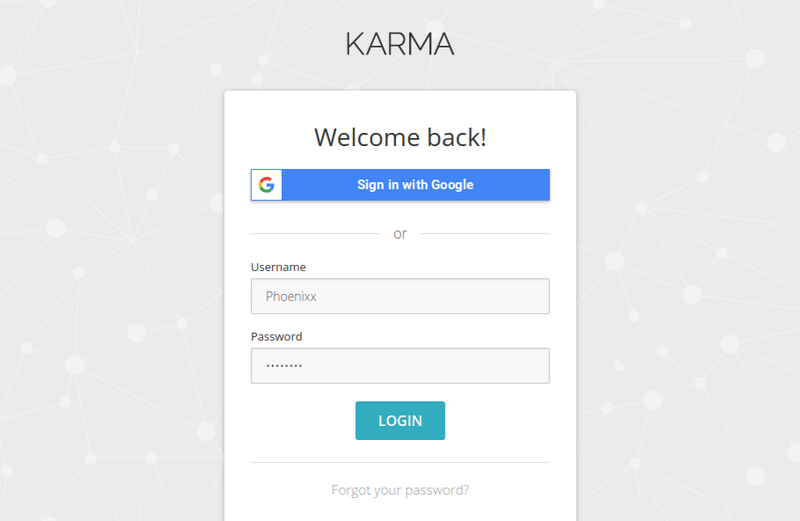 In order to edit your bookings in ScreeningMate’s booking system, users will need to use their login information from ScreeningMate and apply it to Karma Screen. Karma Screen is the system where providers edit, screen and verify their clients. If you’re new to ScreeningMate and Karma Screen, let me show you how it helps with screening. 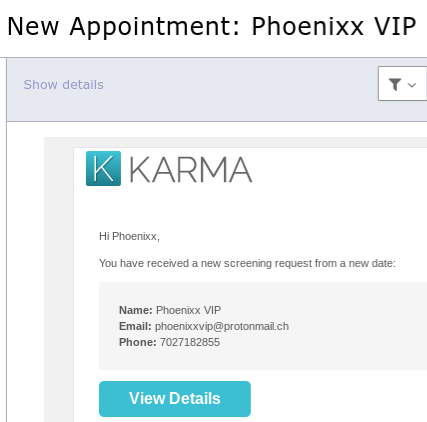 First, Karma Screen will notify you when a client makes a booking via your ScreeningMate form. You can choose to be either notified via email or text. Clients will have the option of either notification via email or text as well. In the notification, you’ll receive the client’s name, email address & phone number. Clicking on the View Details button will take you to your Karma Screen account and give you more info about your potential client. Karma Screen account dashboard with a new client booking. On your account dashboard, you can accept, cancel edit or delete the appointment. If you need to make changes to your client’s booking, clicking Edit will create a pop-up for you to edit the date & location if needed. Clicking Cancel will inform the client of the cancellation. You’re welcome to put a reason, but it’s not required. You can also send a message from your dashboard to the client regarding the cancellation. This is your best option if you just want to banish this potential from your existence. No feelings will be hurt because they won’t know. Hold it there! Their details will need to be screened first before any commitments are made. Simply click on their name to open up more of their info. When they have a low rating of an F, along with no history of rejected screenings, it’s ok. Karma Screen’s system doesn’t have enough verified info on this new client, so they’re automatically failing. After screening, you’ll either accept or reject them. Your choice will become their new & legit rating for Karma Screen. Again, don’t freak over the Not Verified details. Simply use Google & other research tools to screen them to your best judgement. Clients can either verify with their employment info or with references. Be sure to check that the email address actually belongs to the provider! If screening went well, then you can happily accept their booking. You can go back to your dashboard and hit Accept. See? If you go back to your client’s details, you’ll see that they’re now approved and their rating is no longer suspicious! Now, that you’ve whitelisted your client by accepting their booking and approving them, when they screen with another provider’s ScreeningMate form, their rating will be much more higher. Now, this other provider that the client booked for, won’t feel weirded out since the client was whitelisted by you. The other provider should still screen though! Karma Screen & ScreeningMate are cool, but I like them because they’re quick to fill out and it’s great clients trying to book via mobile. The form is super mobile friendly.